Eight executions were scheduled in Arkansas from April 17-27, 2017. The state scheduled two executions per day on four days during that period. 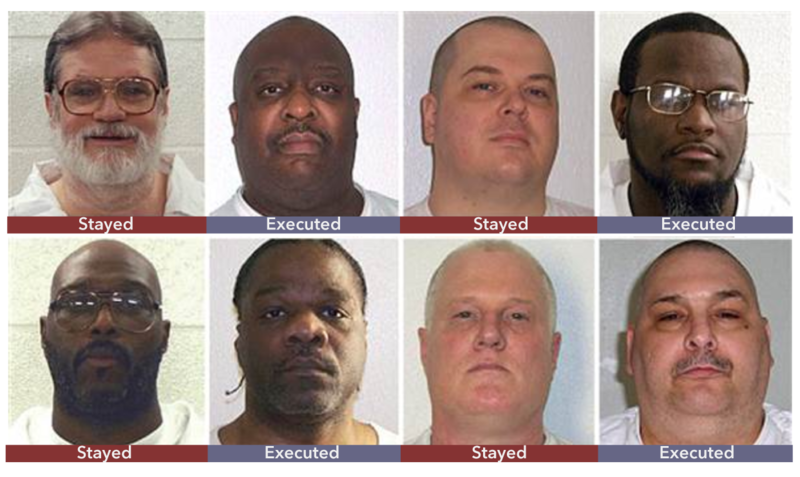 The men scheduled for execution were (top row, from left to right) Bruce Ward, Marcel Williams, Jason McGehee, and Kenneth Williams; (bottom row, from left to right) Stacey Johnson, Ledell Lee, Don Davis, and Jack Jones. The state carried out four executions during this period. 4/17/17 Bruce Ward 8/11/89 10/18/90 32 White White Stayed by Arkansas Supreme Court to permit litigation of competency to be executed. Stayed by Arkansas Supreme Court based on pending Supreme Court decision in McWilliams v. Dunn. 4/17/17 Don Davis 10/12/90 3/6/92 27 White White Stayed by Arkansas Supreme Court based on pending Supreme Court decision in McWilliams v. Dunn. Stayed by Arkansas Supreme Court based on DNA. Read ADC's Internal Affairs Log. 4/27/17 Jason McGehee 8/19/96 1/8/97 20 White White Governor Hutchinson granted clemency. On April 28, in light of reported problems that occurred during the execution, attorneys for Kenneth Williams are requesting a full investigation into the execution. On Thursday, April 27, Arkansas carried out the execution of Kenneth Williams, and he was pronounced dead at 11:05pm CST. Arkansas carried out two executions on Monday, April 24. The state administered the lethal-injection drugs for Jack Jones at 7:06pm CST and he was pronounced dead at 7:20pm CST. Based on problems related to Jones’ execution, attorneys for Marcel Williams filed an emergency motion for stay of execution, which was granted by the federal district judge. Williams’ execution, which was scheduled to begin at 8:15pm CST, was stayed until 9:22pm CST, when the district court vacated the stay. The administration of drugs began at 10:16pm, and Williams was pronounced dead at 10:33pm. On Thursday, April 20, Arkansas carried out the execution of Ledell Lee, and he was pronounced dead at 11:56pm CST. On Wednesday, April 19, the Arkansas Supreme Court issued an order granting a stay for Stacey Johnson and remanding his case for a hearing on DNA. On Monday, April 17, 2017, the Arkansas Supreme Court granted stays of execution to Don Davis and Bruce Ward, after the prisoners filed a Motion to Recall the Mandate and for Stay of Execution based on pending Supreme Court decision in McWilliams v. Dunn. On Monday evening, April 17, around 7pm CST, the State asked the US Supreme Court to vacate the stay for Don Davis. Around 9pm CST, Davis filed a response opposing the State's request. The Supreme Court denied Arkansas' request to vacate the stay of execution for Don Davis. No executions were carried out on April 17. On Friday, April 14, 2017, the Arkansas Supreme Court granted Bruce Ward's request for stay of execution to permit Ward's attorneys to litigate a claim that he is mentally incompetent to be executed. On Saturday, April 15, the state asked the Arkansas Supreme Court to reconsider its stay order. On Monday, April 17, the Arkansas Supreme Court denied the State's request. On April 6, the federal district court granted preliminary injunction staying execution of Jason McGehee until Arkansas Parole Board complies with 30-day public notice period on the Board's 6-1 recommendation to grant clemency and Governor Hutchinson decides whether to grant or deny clemency. On April 25, the State announced that it will not appeal the decision so the execution of Jason McGehee will not take place on April 27. Johnson v. Kelley, No. 16-6496 (U.S. Supreme Court). Arising out of a state lawsuit that was filed in April 2015 challenging the use of midazolam in executions, death-row prisoners filed a petition for writ of certioriari with the Supreme Court on October 19, 2016, after the Arkansas Supreme Court dismissed the underlying lawsuit. On February 21, 2017, the Supreme Court denied review. On February 27, Arkansas governor scheduled 8 executions over an 11-day period beginning April 17. On March 20, 2017, prisoners filed a Petition for Rehearing in the Supreme Court asking it to reconsider its denial of certiorari in light of eight executions scheduled. Read the Petition for rehearing here; the original petition for writ of certiorari here, which was denied on February 22, 2017; and the press release here. The Supreme Court docket for the case is here. On April 17, the prisoners filed an Application for Stay of Execution, asking the Supreme Court to stay their executions until it rules on their motion for reconsideration. On April 20, the Supreme Court denied the application for stay of execution, but did not issue an order in the underlying case. Justices Breyer, Sotomayor, and Kagan would have granted the stay. The Supreme Court has conferenced the case to consider the motion for reconsideration for April 21. On April 24, the Supreme Court denied the motion for reconsideration filed by petitioners. Justice Sotomayor would have granted the motion. Johnson v. Kelley, No. 60CV-15-2921 (State Court, Circuit Court of Pulaski County). On February 24, 2017, after certiorari was denied, prisoners filed a Second Amended Complaint in Pulaski County, Arkansas challenging lethal-injection protocol. Read the Second Amended Complaint here. On March 28, 2017, the Circuit Court issued an order dismissing the case. On April 3, the prisoners filed a motion for reconsideration and on April 21, asked the court to rule on that motion before it becomes moot. McGehee v. Hutchinson, No. 4:17-cv-179 (Federal Court; E. Dist. of Ark.) On March 27, 2017, Prisoners filed a lawsuit in federal district court challenging the schedule of 8 executions over 11-day period wiith the use of the drug midazolam as violating their right to counsel, their right of access to the courts, and the Eighth Amendment. Read the Complaint here; Motion for Preliminary Injunction here; Memorandum in Support of Preliminary Injunction here. A hearing was held April 10-13. On April 15, the federal district court issued a preliminary injunction, which prevented Arkansas from moving forward with the executions. On April 17, the parties filed with the district court a Joint Proposed Execution Viewing Policy, which will be used should executions be carried out. On April 16, Arkansas prosecutors appealed to the U.S. Court of Appeals for the Eighth Circuit, No. 17-1804, asking that court to vacate the injunction. The prisoners filed an opposition to the state's motion, and the state filed a reply. On April 17, the Eighth Circuit vacated the preliminary injunction; Judge Kelly dissented. On April 19, the prisoners asked the U.S. Supreme Court, Nos. 16-8770; 16A-1003, to review the Eighth Circuit's decision specifically as it relates to the execution protocol. Read the petition for writ of certiorari here; read the stay application here. On April 20, the Supreme Court denied the stay, and denied certiorari. Justices Ginsburg and Sotomayor would have granted certiorari; Justices Ginsburg, Breyer, Sotomayor, and Kagan would have granted the stay. Justice Breyer wrote a dissent, here. Justice Sotomayor wrote a dissent, here. On April 19, the prisoners also asked the U.S. Supreme Court, Nos. 16-8787; 16A1006, to review the Eighth Circuit's decision specifically as it relates to the execution schedule, asking the Court to consider whether scheduling four double executions to occur over a period of eleven days violates evolving standards of decency under the Eighth Amendment. Read the petition for writ of certiorari here; read the stay application here. On April 20, the Supreme Court denied the stay, and denied certiorari. Justice Breyer would have granted certiorari. On April 22, the prisoners asked the federal district court judge to modify the Joint Proposed Execution Viewing Policy, which was filed April 17. In their motion, prisoners wanted the court to clarify that the execution commences from the time that a prisoner is brought into the execution chamber and therefore their attorneys should witness that part of the execution, through the insertion of IV lines, until death. (Read motion here.) On April 23, the district court denied the motion stating that the plaintiffs/prisoners could have raised this issue during negotiations before filing the joint agreement. Lee v. Hutchinson, Case No. 4:17-cv-194 (Federal Court; E. Dist. of Ark.) On March 28, 2017, prisoners filed lawsuit in federal district court challenging the clemency process. Read the Complaint here; Motion for Preliminary Injunction here; Memorandum in Support of Preliminary Injunction here; press release here. The court conducted a hearing on the prisoners' motion on April 4. On April 6, the district court issued an order granting in part and denying in part the preliminary injunction. The court issued an injunction staying the execution of Jason McGehee, for whom the parole board recommended clemency. Under the statute, the parole board must give 30 days for public comment and notice to individuals before sending its recommendation to governor; McGehee's scheduled execution will occur before the expiration of that 30-day time frame. The court dimissed the lawsuit for Bruce Ward (who lacked standing because he did not apply for clemency), held the matter in abeyance for Jack Jones (who had a clemency hearing on Friday, April 7), and denied preliminary injunctions for the other prisoners. On April 19, Ledell Lee filed with the district court an Amended Motion for Preliminary Injunction (styled as a motion to reconsider the denial of relief) based on new mitigating evidence. On April 18, an appeal was filed with the Eighth Circuit, No. 17-1822, by Stacey Johnson, Ledell Lee, Kenneth Williams, and Marcel Williams. On April 20, the Eighth Circuit denied relief, with a dissent by Judge Kelly. Read the opinion here. On April 20, the U.S. Supreme Court denied Lee's application for a stay and denied certiorari. McKesson Medical-Surgical, Inc. v. State, 60CV-17-1921 (State Court, Circuit Court of Pulaski County). On April 14: McKesson Medical-Surgical, distributor of vecuronium bromide -- a paralytic and the second drug in the state's three-drug formula -- filed a lawsuit in state court alleging that Arkansas violated the distributor's agreements and seeking an injunction against the use of the drug in executions. Read the: Complaint, Motion for Temporary Restraining Order, and Brief in Support. At 4:45pm, on April 14, the court issued a temporary restraining order preventing the State from using the drug. Arkansas prosecutors appealed, questioning the impartiality of the state court judge. On April 15, McKesson requested that the state injunction it had won be vacated, saying that the federal preliminary injunction (entered in 4:17-cv-179) had made the state injunction unnecessary. On Monday, April 17, the Arkansas Supreme Court vacated the temporary restraining order and ordered that the judge be removed from the case. On April 18, McKesson re-filed its lawsuit, now Case No. 60cv-17-1960, in the Circuit Court of Pulaski County. The complaint is here; the motion for temporary restraining order (TRO) is here; and the brief in support of the TRO is here. The case was assigned to Judge Alice Gray. Also on April 18, the State moved to change venue. The motion is here. On April 19, the State filed a motion to dismiss and brief in support. Also on April 19, the State filed its response to the motion for TRO. The court held a hearing on the motions at 12:30pm CST on April 19. On April 19, at 6:20 pm CST, the Circuit Court for Pulaski County issued a temporary restraining order preventing Arkansas from using the drug vecuronium bromide obtained from McKesson in upcoming executions. The written order is accessible here. On April 20, the State filed an Emergency Motion for Immediate Stay with the Arkansas Supreme Court, Case No. CV-17-317, asking that court to stay the injunction order issued by the circuit court. The State's motion is here. On April 20, the Arkansas Supreme Court granted the State's motion to stay the lower court's TRO, thereby lifting the stay that was in place preventing the state from using vecuronium bromide in executions; briefing was ordered to commence. Ward v. State, No. CV-17-291 (State Court; Arkansas Supreme Court): On April 13, 2017, Bruce Ward filed an Emergency Petition for Stay of Execution to permit his attorneys to litigate a claim that he is mentally incompetent to be executed. On April 14, the Arkansas Supreme Court granted a stay. On Saturday, April 15, the state asked the Arkansas Supreme Court to reconsider its stay order. On Monday, April 17, the Arkansas Supreme Court denied the State's request. Ward v. State, No. CR-98-657 (State Court; Arkansas Supreme Court). On April 12, Bruce Ward filed a Motion to Recall the Mandate and for Stay of Execution based on pending U.S. Supreme Court decision in McWilliams v. Dunn. On Monday, April 17, 2017, the Arkansas Supreme Court granted a stay of execution to Bruce Ward. Davis v. State, No. CR-92-1385 (State Court; Arkansas Supreme Court). On April 12, Don Davis filed a Motion to Recall the Mandate and for Stay of Execution based on pending U.S. Supreme Court decision in McWilliams v. Dunn. On Monday, April 17, 2017, the Arkansas Supreme Court granted a stay of execution to Don Davis. On Monday evening, April 17, around 7pm CST, the State asked the US Supreme Court to vacate the stay for Don Davis. Around 9pm CST, Davis filed a response opposing the State's request. The Supreme Court denied Arkansas' request to vacate the stay of execution for Don Davis. Johnson v. State, No. CR-93-54 (State Court; Circuit Court of Sevier County). On April 13, Stacey Johnson filed a motion for DNA testing, aruging that DNA testing be conducted to prove his innocence. Read the motion here; read the press release by the Innocence Project. On April 17, the court issued an order denying Johnson's request. On April 18, Johnson filed a motion for stay of execution with the Arkansas Supreme Court (No. CR-17-312), asking for an order remanding his case for a hearing on his motion for DNA testing. Read the stay motion here. On April 19, the Arkansas Supreme Court issued an order granting the stay and remanding his case for a hearing on DNA. Kenneth Williams v. State, No. 60CV-17-2102 (State Court; Pulaski County Circuit Court): On April 27, 2017, Kenneth Williams filed a complaint (with attached exhibits) alleging that his own medical issues and the State's failure to follow its own execution protocol will result in due process violation and cruel and unusual punishment under the Arkansas Constitution. Kenneth Williams v. State, No.CV-17-346 (State Court; Arkansas Supreme Court): On April 27, Kenneth Williams filed an Emergency Motion for Stay of Execution to Preserve this Court's Jurisdiction, asking that his execution be stayed so that he could litigate the case in Pulaski County. On April 27, the Arkansas Supreme Court denied the motion to stay. Kenneth Williams v. Kelley, 5:07-cv-00234 (Federal Court; E. Dist. of Ark. ): On April 25, Kenneth Williams filed a motion for relief from judgment, an amended habeas petition, and two motions for a stay of execution alleging juror misconduct and intellectual disability. On April 26, the federal district court entered an order transferring the case to the Eighth Circuit because it lacked jurisdiction. On April 26, Williams filed his appeal in the Eighth Circuit (Nos. 17-1892, 17-1893, 17-1896). He filed a motion for certificate of appealability asking the Eighth Circuit to review the district court's denial of relief and filed a motion to stay his execution. He also filed a protective application to file a successive habeas petition, along with a motion to stay his execution. The filings relate to Williams's intellectual disability and juror misconduct. On April 27, at approximately 5:06pm CST the Eighth Circuit issued an opinion denying the district court authorization to consider the petition, denying the motion for certificate of appealability, denying the protective application, and denying the stay. Judge Kelly dissented in part, saying that she would allow review of his intellectual disability claim, but concurred in the holding that the juror misconduct claim is barred as a successive petition and concurred (reluctantly) in the denial of the stay application. Kenneth Williams v. State, No. CR-06-511 (State Court; Arkansas Supreme Court): On April 21, 2017, Kenneth Williams filed a Motion for Stay of Execution Pending Petition for Writ of Habeas Corpus in Circuit Court of Lincoln County based on intellectual disability. On April 26, the Arkansas Supreme Court denied Williams' stay motion. Kenneth Williams v. State, No. 40CV-17-46 (State Court; Lincoln County Circuit Court): On April 21, 2017, Kenneth Williams filed a Petition for Writ of Habeas Corpus based on intellectual disability. On April 24, the court dismissed the petition for facial defect. On April 25, Williams filed a corrected petition, and the State filed its response. On April 27, the circuit court issued an order dismissing the petition. Kenneth Williams v. State, No. 17-349 (State Court; Arkansas Supreme Court): On April 27, 2017, Kenneth Williams filed a motion to stay his execution pending appeal of Lincoln County Circuit Court's denial of his petition for writ of habeas corpus. On April 27, the Arkansas Supreme Court denied his stay motion. Kenneth Williams v. State, No. CR-06-511 (State Court; Arkansas Supreme Court): On April 24, 2017, Kenneth Williams filed a Motion to Recall the Mandate and Motion for Stay of Execution Concerning Jurors' Failure to Consider Mitigating Evidence, which included evidence Williams is borderline mentally retarded, that he witnessed “chronic marital conflict” and domestic abuse when his father was in the home, that he grew up in “marked poverty,” and that he suffered from inadequate parenting on account of his mother’s mental retardation. On April 26, the Arkansas Supreme Court denied Williams' motion to recall mandate and for stay of execution. On April 27, attorneys for Kenneth Williams petitioned Governor Asa Hutchinson for a temporary reprieve from his execution to allow the Arkansas Parole Board to consider new facts they have obtained since Mr. Williams’ March 31, 2017 clemency hearing. The attorneys are seeking a reprieve so the Parole Board can consider additional evidence that Mr. Williams is intellectually disabled and ineligible for the death penalty, and to give Kayla Greenwood, the daughter of non-capital victim Michael Greenwood, and Stacey Yaw, Mr. Greenwood's widow, an opportunity to testify at the Arkansas Parole Board in support of Mr. Williams’ clemency. Members of the Greenwood family also sought an opportunity to meet with Governor Hutchinson in the hope that he would spare Mr. Williams’ life. The Reprieve letter can be accessed here. Governor Hutchinson declined to grant a reprieve. Marcel Williams v. Kelley, No. CR-97-949 (State Court; Arkansas Supreme Court): On April 24, 2017, Marcel Williams filed a Motion to Recall the Mandate and For Stay of Execution alleging that his counsel plagarized his brief and asking the Court to stay his execution until the U.S. Supreme Court decides the case Davila v. Davis, a case in which the Court heard argument today. At 7:27pm CST, the Court denied the motion. Marcel Williams v. Kelley, No. 5:17-cv-00103-KGB (Federal Court; E. Dist. of Ark. ): Marcel Williams filed a lawsuit in federal court on April 11, 2017, alleging that executing him under the current lethal-injection protocol would violate the Eighth Amendment due to his multiple health conditions, including diabetes, hypertension, hypertriglyceridemia, hypercholesterolemia, morbid obesity, and sleep apnea. Read the complaint here. On April 18, the Court issued an order requiring Williams to show cause why his complaint should not be dismissed in light of the Eighth Circuit's ruling McGehee v. Hutchinson, No. 17-1804 (the ruling from April 17 that vacated the prisoners' preliminary injunction granted on lethal-injection challenge). On April 18, McWilliams filed his response to the order. On April 21, the district court denied Williams's request to stay his execution. On April 21, Williams appealed the denial of relief to the Eighth Circuit, No. 17-1848. Briefing was completed at 09:53 PM on April 23. On April 24, at 02:13 PM CST, Eighth Circuit denied Williams' request for a stay of execution pending reivew of his appeal. On April 24, Williams filed an application for stay of execution and a petition for writ of certiorari with the U.S. Supreme Court, 16-8815 (16A1029). On April 24, the Supreme Court denied the stay; Justice Sotomayor dissented from the denial. On April 24, shortly before his scheduled execution time of 8:15pm CST, Marcel Williams filed emergency motion for stay based on problems with Jones' executiona. The federal district judge issued a Temporary Stay at 8:15pm CST. The State then filed an opposition to Wiliams' emergency motion. At 9:22pm CST, TEMPORARY STAY WAS LIFTED. Here is the transcript of the hearing that was held between 8:47pm and 9:21pm. Marcel Williams v. Kelley, No. 5:02-cv-00450-JLH (Federal Court; E. Dist. of Ark. ): On April 1, 2017, Marcel Williams filed a motion in his federal habeas case asking the court to re-open his case based on Supreme Court cases Martinez v. Ryan and Trevino v. Thaler, and determine whether he is entitled to relief on ineffective assistance of counsel during the guilt/innocence phase of his trial. On April 18, the district court denied the motion. On April 21, Williams appealed the denial of relief to the Eighth Circuit, No. 17-1825. Briefing was completed at 04:56 PM on April 23. On April 24, at 01:42 PM CST, Eighth Circuit denied Williams' request for a stay of execution pending reivew of his appeal. On April 24, Williams filed an application for stay of execution and a petition for writ of certiorari with the U.S. Supreme Court, 16-8816 (16A1030). On April 24, the Supreme Court denied the stay. Marcel Williams v. Kelley, No. CR-97-949 (State Court; Arkansas Supreme Court): On April 19, 2017, Marcel Williams filed an Emergency Motion to Recall the Mandate and for Stay of Execution asserting that his direct appeal was defective because his sentencing-phase verdict forms were absent from the record. After the verdict forms were made part of the record, on April 22, Williams filed a supplemental motion to his original motion, explaining that the jury forms do not demonstrate that the jury properly reviewed the mitigation evidence. On April 24, at 12:29pm CST, the Arkansas Supreme Court denied the motion for stay. Jones v. State, No. CR-96-541 (State Court; Arkansas Supreme Court): On April 23, Jack Jones filed a Motion for Recall of Mandate and Motion for Stay of Execution asserting that his jury verdict at the penalty phase was based on inconsistent findings regarding mitigation. On April 24, at 12:32pm CST, the Arkansas Supreme Court denied the motion for stay. On April 24, Jones filed a motion to stay his execution with the U.S. Supreme Court. At approximately 6:15pmCST, the Supreme Court denied his request. Jones v. Kelley, No. 5:17-cv-00111 (Federal Court; E. Dist. of Ark. ): On April 17, Jack Jones filed a lawsuit and motion for preliminary injunction alleging that executing him under the current lethal-injection protocol would violate the Eighth Amendment due to his multiple health conditions, including diabetes and sleep apnea, because these conditions would prevent midazolam from working properly. On April 21, the district court denied Jones' request for preliminary injunction. On April 22, Jones appealed the denial of relief to the Eighth Circuit, No. 17-1849. On April 24, at 11:32am CST, the Eighth Circuit issued an order affirming the denial of relief and found that Jones was not diligent in bringing his claim, that he had not demonstrated that a significant possibility that he can "show that the Arkansas protocol is sure or very likely to cause severe pain and needless suffering" and that he had not provided an alternative method of execution. Lee v. State, Case No. 60CR-93-1249 (State Court, Circuit Court of Pulaski County). On April 17, 2017: Ledell Lee filed lawsuit in state court seeking to have DNA testing and a hearing related to his innocence. His motion for relief is here; the State's response is here. Oral argument scheduled for 1:30pm on April 18. On April 18, the court issued an order denying Lee's request. On April 19, Lee appealed the denial of relief and filed a motion to stay his execution in the Arkansas Supreme Court, CR-17-315. On April 20, the Arkansas Supreme Court denied Lee's appeal and stay of execution; Justice Hart dissented and would have granted the DNA motion, pointing out that "Lee’s postconviction request is identical to the request made in Johnson v. State, CR-17-312, a case decided only yesterday in which [the Court] stayed Stacey Johnson’s execution and remanded to the circuit court on Johnson’s motion for postconviction DNA testing." Justice Hart said she was "at a loss to explain this court’s dissimilar treatment of similarly situated litigants." On April 20, at approximately 8:20pm CST, the U.S. Supreme Court granted a temporary stay to review the pleadings. The Supreme Court denied the stay application, and vacated the temporary stay at approximately 11:25pm CST. Lee v. State, Case No. CR-08-160 (State Court; Arkansas Supreme Court). On April 19, Lee filed a motion to recall the mandate and for a stay of execution in the Arkansas Supreme Court (Case No. CR-08-160), arguing that his execution should be stayed, his post-conviction case should be re-opened, and he should be permitted DNA testing. This issue was not previously litigated due to his intellectual disability and his prior counsel's failure to investigate and request such testing. On April 20, the Arkansas Supreme Court denied Lee's motion to recall the mandate and his request for stay of execution. Lee v. Kelley, No. 5:01-cv-00377-DPM (Federal Court; E. Dist. of Ark.). On April 18, 2107, Ledell Lee filed a motion for post-conviction relief in the federal district court seeking habeas relief due to the breakdown of counsel at every stage of his proceedings, which resulted in the failure to present mitigating evidence of intellectual disability, brain dysfunction, and fetal alcohol syndrome. On April 20, the district court denied relief. Also on April 20, the Eighth Circuit (Case No. 17-1838) denied relief. Lee v. State, No. CR96-553 (State Court; Arkansas Supreme Court). On April 20, Ledell Lee filed a motion to recall the mandate and for a writ of error coram nobis on the basis that Lee may be intellectually disabled. On April 20, the Arkansas Supreme Court denied the motion. DPIC Analysis: What is the Most Executions Conducted in the U.S. in the Shortest Time Span? : A DPIC data analysis of previous high-volume execution periods, including multiple executions carried out on the same day. Arkansas Schedules Unprecedented Eight Executions in Ten-Day Period: A DPIC short summary of Arkansas' announcement of the execution schedule, and the reasons for carrying out so many executions in a short period. Prisoners on Arkansas's Execution List Defined by Mental Illness, Intellectual Disability, and Bad Lawyering: A report by the Fair Punishment Project on the legal and psychological issues in the eight cases scheduled for execution. Features brief case summaries for all eight prisoners. Corrections Officials Warn Arkansas Leaders About Psychological Trauma From Unprecedented Execution Schedule: A compilation of quotes from former corrections officials, warning that the hurried execution schedule could have negative mental health effects on prison personnel. Letter to Governor Hutchinson from Former Corrections Officials: Former corrections officials and administrators (some of whom have directly overseen executions) write Governor Hutchinson asking him to reconsider the condensed execution schedule. Arkansas Prisoners, Asserting Their Innocence, File Requests for DNA Testing: A DPIC summary of the innocence claims filed by Stacey Johnson and Ledell Lee. Arkansas Lethal-Injection Protocol: This is the chemical chart that Arkansas intends to use to carry out the upcoming executions.